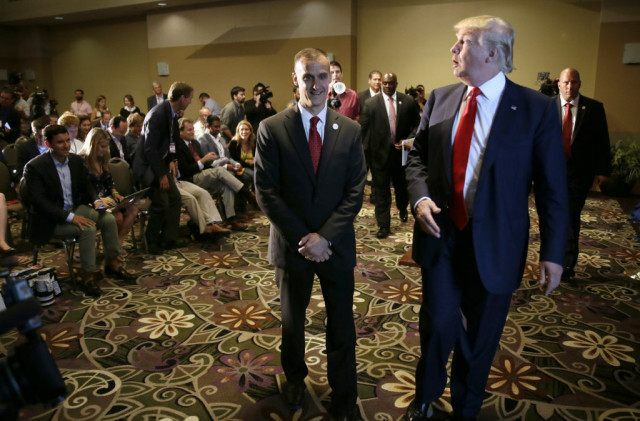 WEST PALM BEACH, Fla. (AP) — Donald Trump’s campaign manager won’t be prosecuted for battery after briefly grabbing a female reporter’s arm at a campaign event, but prosecutors said Thursday the situation might have been avoided with two simple words: I’m sorry. State Attorney Dave Aronberg said at a news conference there wasn’t enough evidence to justify bringing misdemeanor simple battery charges against Corey Lewandowski for the March 8 dustup with Michelle Fields, then a reporter for the conservative Breitbart News website. Although Lewandowski’s act wasn’t criminal, Aronberg said there may have been an easy way to defuse things. Although police in Jupiter, Florida, found enough probable cause to charge Lewandowski last month after viewing a video recording of the encounter, Aronberg said prosecutors are held to a higher legal standard. “We have the burden of proving each case beyond a reasonable doubt,” he said. The investigation proved that Lewandowski “pulled Ms. Fields back” as she attempted to interview Trump, according to a memo by another prosecutor, Chief Assistant State Attorney Adrienne Ellis. The memo says Lewandowski could have believed Fields was “making unwanted physical contact with Mr. Trump” that led him to pull her away. Ellis added that the video showed Trump moving his arm away from Fields’ initial contact, but said that didn’t constitute battery either. “It was incidental,” she said. “She wanted a prosecution to go forward,” he said. Aronberg is a Democrat, a former state legislator who served with Republican Sen. Marco Rubio in Tallahassee and lived in the same dormitory for a time as Texas Sen. Ted Cruz at Harvard Law School. He said he understood the case had garnered international attention, but the political climate did not affect his decision. He also said he and several members of his office had spoken by phone with Trump — who lives part-time in Palm Beach County — about the case.